The sun is doing its best to try and stay out and brighten up what is a damp and slightly windy day here in the bay, I feel its fighting a losing battle and we are in for a showery day and it may well be a wet and windy afternoon up at Plainmoor. 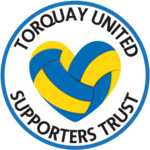 I sit here and wonder what I will be writing in my match report early this evening, how great it would be to do a report on a game we won for a change; I can but hope like all other TUFC fans that today will be the day we finally get three points from a game. We as fans could sure do with a lift this weekend and not end up feeling even more down in the dumps about our team and having any worries we might have strengthened because we lost the game. I go to all games believing we will win and today will be no different and what I want to see is the team give everything they have to get the result and if at the end of the day they did that but were beaten by a better team, then so be it. You have to earn the right to win any game and you need to keep your heads up when things are not going your way, playing the game for the whole 90 minutes and never giving up and never stop believing. Bevan will be in goal for sure and we really need to see the Jake Thomson who first came here, if we do then the odds will be so much more in our favour and we do need to play him as Zebs just has to be upfront. Barnes I also expect to start and do feel he will score today, one thing I liked about him was at our last home game he was still fired up and willing those around him in the dieing seconds of the game as clearly winning a game he is playing in is important to him. Benyon will surely be on the bench as we all know he is better coming off the bench later in a game than starting it and could he be a super sub yet again for us? Ellis has to keep his place along side Branston and I would be disappointed if Bucks does not start him as we need the fight he will bring into this game and he is also very likely to get a goal at the other end from a corner or set piece. Mansell needs to start as Thompson for me is just not doing it and we can’t afford to day to just get over run in the midfield as we have been in some games lately. The big question is will Bucks start Carlisle who is back after being out for six weeks. As much as we need him I feel that as we have another game on Tuesday at home, that Bucks won’t start him and will look to bring in on later in the game. We might start him and just give him 60 odd minutes with the view of starting with him on Tuesday night, but much will depend of how today’s game unfolds and also how he is doing himself, but we do need players like him and also Rendell back and playing in as many games as possible to give us the best chance of staying up. I still firmly believe that while it’s going to be tight at the end of this season, we will stay up and then I will be looking to see our club build a much better and stronger side to really make a better challenge in this league next season. Here’s hoping for three wonderful points today and I care not how we get them, today for me is not about watching a game of football the way its meant to be played, but winning a game and getting those points that will make us all feel that much better tonight. Stating the obvious I know, but it's a huge game today. Without Muzzy's equaliser at Whaddon Road on Tuesday night I think PB might've been struggling to keep himself in a job but such moments make or break managerial careers. Every manager get's a "Mark Robins moment" and let's hope Muzzy's strike was PBs. Lose today and well it's going to be touch and go whether he'll be the manager for much longer. I'm at a loose end in London today. The fixtures are hardly inspiring. Millwall V Hartlepools, Brentford V Tranmere, Leyton Orient V Swindon, Barnet V Bury, Dag and R V Grimsby, Hayes and Yeading V Mansfield, Staines V Eastleigh or maybe even Welling V Bath City. I haven't been to Millwall or Welling! I would feel a lot happier if we had a Chris Hargreaves replacement (or indeed the real thing) and a big hold the ball up centre forward. Until we do, we will struggle. Got to be the D&R vs Grimsby due to the fact that we are playing them both soon and you can let us know if Grimsby stand a chance of beating the drop! With Benners to come on in the 78th and bag the winner! So important to keep the pressure off our young team. Encourage even if isnt going well and you never know we may get the right result. No Jake in today's squad then? Glad to hear it. Another non-battler. Bevs saved the day again. Well done titch. Was surprised to see that - I thought getting back onto the squad at Cheltenham might have done him some good. A half fit Carlisle or a fully fit Thomson on the bench today? Carlisle for me every time after the last couple of months and Bucks has surely made the right call on this one. The crowd sounds awesome today! Pleasing to hear... mind you, sounds an entertaining game. Jamie Ward sticks the knife into Argyle, Exeter 1-0 down at Brighton... Torquay impotent up front? Yet again the Beeb f**k up...................missed the first minute of the first half and now they've lost it totally and the second half has started four minutes ago!